On board AmaViola, the vessel’s facilities are absolutely superb. From the lounge (where daily late breakfasts, light lunches, tapas and afternoon snacks are served) to the main Restaurant and the Chef’s Table Restaurant, dining options are endless. (A marathon may be on the cards on return!) Forget notions of tiny cabins as the staterooms are spacious, comfortable and well designed. Ditto bathrooms. As it’s Monday, it must be Vienna, so a city tour drove us round the Ringstrasse and walked us through the compact centre. Oh, the architecture. Cupolas, domes, Churches and Palaces in Baroque, Renaissance, Rococo, Gothic and Grecian styles and homage to Mozart, Strauss and native artist, Gustav Klimt at every juncture. Later, it will be Sip ‘N Sail (cocktail time on board to all ye landlubbers! ), then a concert of glorious classical music. Shmoozin ‘n cruising with Sunway and AmaWaterways – no better way to cruise the Danube and see the sights of Europe with 5 star luxury on board AmaViola. A night of sweet melodies (Melodies of the Danube, doncha know!) with marvellous orchestral mixes of Mozart and Strauss, held in Vienna’s Kursalon was an unforgettable evening of elegance and enjoyment. Travelbiz even visited Cafe Sacher, but managed to forego the famous sachertorte! AmaWaterways certainly knows how to choose excursions and city highlights. This river cruise on the Danube is the most delightful way to see several countries in one fell swoop and experience a 5 star floating hotel at the same time! Today we visit Durnstein, a picture-perfect Austrian village that could jump out of a fairytale. Tiny meandering streets, full of higgledy piggledy houses and sloping turrets are heaven sent for Rumpelstiltskin. 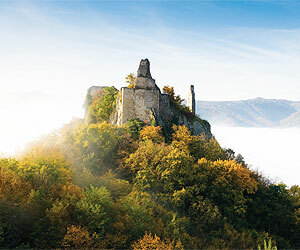 The entire Wachau Valley is a UNESCO World Heritage Site, speckled with hillside vineyards and sprinkled with charming castles and picturesque hamlets. Back on board, more delicious food is laid out for our delectation and the amazing crew are on hand, including super efficient Raul and Victoria. An invitation to the Captain’s Cocktail Party in the Library, followed by dinner at the Captain’s Table, is on tonight’s agenda. Ship ahoy! Sunway, you sure know how to spoil your guests on AmaWaterways. There was shmoozin’ at the Captain’s Table, then further superb food at The Chef’s Table as AmaViola’s chef presents plates like pieces of edible art. We walk lovely Linz and after drive over the Czech Republic border to the hamlet of Cesky Krumlov – another UNESCO World Heritage Site and a fairytale kingdom of magical medieval houses and cobbled streets. Imagine two countries in one day? It’s all possible on a Sunway river cruise with AmaWaterways. Sip n Sail is the tempting tradition of cocktail time on board, then great entertainment each evening follows the dining experiences. It’s simply non-stop enjoyment. We’re actually in Passau, Germany this morning, so a taste of Bavaria beckons. Sail away with Sunway and AmaWaterways. I’m off to try the liederhosen in time for the beer festival in Vilshofen later. Prosit! From Budapest to Bratislava, onwards to Vienna; Linz to Cesky Krumlov and Passau, Bavaria, our river cruise has covered 5 countries and some of the most picturesque landscapes, fairytale villages, medieval hamlets and all the majesty and romance of the Danube herself. My vessel, the AmaViola, is a wonderful ship with excellent crew who are super efficient and uber friendly. If you seek a relaxing holiday where literally every need is fulfilled, then look no further. A river cruise is very special. Banish the image of huge ships with thousands of people milling around and bun fights at the buffet. On the contrary, a river cruise is gentle and sophisticated with top-class service, excellent cuisine, exciting excursions and comfort all the way. A river cruise is my new favourite way to travel. Sunway & AmaWaterways have it sussed! Sunway is the only way! Jacinta travelled with Sunway on the Melodies of the Danube Rivercruise.